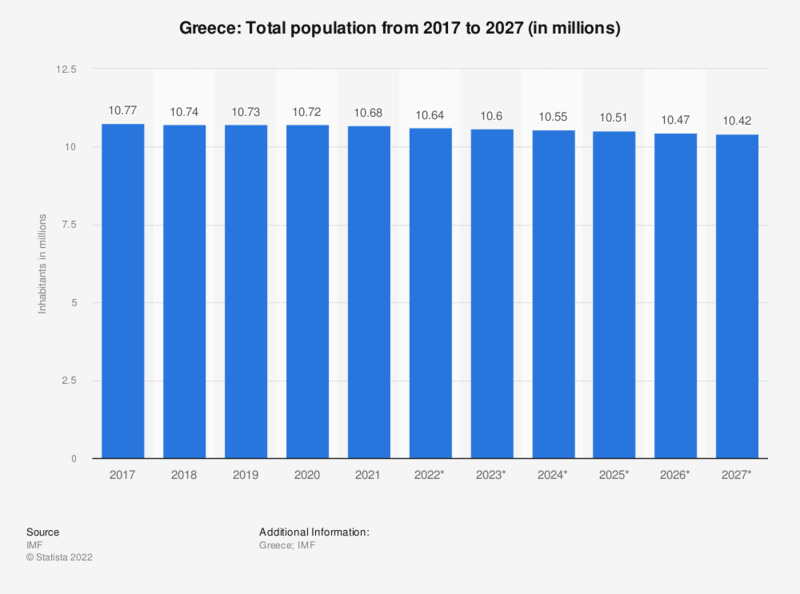 This statistic shows the total population of Greece from 2012 to 2017, with projections up until 2022. In 2017, the total population of Greece was around 10.77 million people. After a subtle year-over-year increase from 2004 to 2011, the population of Greece has experienced a slight drop from 2011 until 2014. Population growth decreased marginally in 2011 compared to the previous year, and once again in 2012 in comparison to 2011. Greek women also bore fewer children per woman on average in 2011, a slight decrease from 2010. But a lower fertility rate is not necessarily the only reason for the country’s total population decline, Greece’s recent economic downturn also plays a role. Due to poor decisions in regards to spending made by the government, Greece has suffered through an economic crisis since 2010, diminishing the incentive to live in the country. The unemployment rate dramatically surged since the crisis, reaching a decade high in 2013. Additionally, the country’s GDP has significantly dropped in the same time frame from 2008 to 2013, with the largest slump in GDP growth occurring in 2011. Despite a severe economic slump, Greece still managed to maintain a relatively high HDI value in 2012, preserving a spot among the top 30 countries worldwide. The HDI, or Human Development Index, is based on parameters such as literacy rate, education levels, GNI and life expectancy, which was one of the highest in the world in 2011.